What a malarky sentence. It’s never safe. Ever. Stop thinking that people. There will always be something in there to kill you. Take this brand new sea snake discovered off the coast of Australia. It’s venomous and coated in spikes, just in case that first part wasn’t enough. Though some other sea snakes have spiky scales on their bellies, “no other [known] sea snake has this curious feature,” study leader Kanishka Ukuwela, an ecologist at the University of Adelaide, said by email. 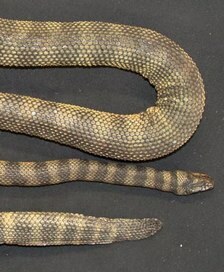 Normally snakes have smooth scales, but each of the newly named Hydrophis donaldi’s scales has a spiny projection, he said. Scientists cruising shallow seagrass beds in the Gulf of Carpentaria (map) recently captured nine of the rough-scaled reptiles. Seriously, the ocean is a soup of terror. I will never feel at ease until James Cameron personally murders all of these horrifying little goblins and any others we haven’t accidentally run across. From here on out, I live my life by the SALTY LANGUAGE PLEASE DON’T CLICK UNLESS YOU WANT TO HEAR CURSE WORDS code of Chris Cooper in Adaptation. You are currently browsing the archives for the Snakes category.